Daymond John can currently be seen on ABC’s four-time Emmy Award winning television series “Shark Tank”which begins its 10th season on Sunday night, October 7th. In addition to his wildly successful role on “Shark Tank,” John is a two-time New York Times best selling author who also was named a Presidential Ambassador for Global Entrepreneurship under the Obama Administration for his relentless commitment to promoting and supporting entrepreneurs. From the streets of Hollis, Queens, John started a global movement from the basement of his mother’s house by capitalizing on the then fledgling hip-hop culture. John initially made his mark as the entrepreneur and branding expert behind the groundbreaking lifestyle brand, FUBU, which eclipsed more than $6 billion in global retail sales. Today, the streetwear market that FUBU pioneered is a $20 billion industry. 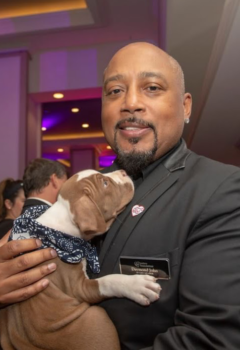 Daymond continues to serve as the CEO and run the day-to-day business of The Shark Group, the leading service provider for celebrity and social media influencers, merchandise manufacturing and brand development. Additionally, he sits on the board of the Yale Center for Dyslexia & Creativity and remains an ambassador for Global Citizen, the Global Poverty Project and The My Brother’s Keeper initiatives. Additionally, in 2017 he joined the board of the Petco Foundation as a way to further his belief that success is not about money, rather doing things like saving animals who can’t fight for themselves and giving them opportunities for better lives.